To open the forum, ISDP welcomed Ms. Marvi Memon, former Pakistani Federal Minister and Chairperson of the Benazir Income Support Program (BISP) for a presentation on the history of the China Pakistan Economic Corridor (CPEC) and its political and social impact on Pakistan. The presentation was followed by a panel discussion with Henrik Chetan Aspengren, Research Fellow at the Swedish Institute of International Affairs, and Jiayi Zhou, Researcher at the Stockholm International Peace Research Institute. The discussion was moderated by Mats Engman, Distinguished Military Fellow at ISDP. Since its announcement in 2015, CPEC has been hailed both as a positive step in relations with China and as a cure to Pakistan’s economic woes. However, the project has also been criticized for spurring regional tensions, particularly because of Pakistan’s geostrategic location and its ongoing rivalry with India. The forum’s main discussions centered upon the effects on the Pakistani economy, as well as how the project can be considered a gamechanger in the overall region. One central theme debated by Ms. Memon and the panel was the consequential geopolitical issues which accompany the implementation of CPEC. Ms. Memon noted that CPEC´s main goal is to develop and operationalize the Gwadar Port, which overlooks the Arabian Sea, allowing China to gain strong projection capacities in the Arabian Sea and eventually onward into the Indian Ocean. For India, the stakes are high, since most of its energy supplies cross the Indian Ocean. CPEC is often described as the lynchpin of the Belt and Road Initiative (BRI). According to Ms. Memon, CPEC enjoys a unique configuration as it connects the BRI’s maritime silk route to the overland route. She believes that the project is a win-win solution for the whole international system, as it can reduce costs and benefit a multitude of economies. China in particular has lot to win from this partnership, as a fully-developed CPEC could provide the country with new possibilities for boosting the development of its western province of Xinjiang thanks to the ease of access to goods provided by Pakistan’s Gwadar port. Moreover, the Gwadar port also links western China with central Asia, diminishing PRC’s reliance on the Malacca strait. Ms. Memon highlighted how Gwadar can further cooperate with other ports in the region, such as the Chabahar port in Iran, to foster financial, industrial and energy capacity collaboration between Pakistan and Iran. In terms of criticisms, Ms. Zhou pointed out how many Western nations are concerned about how CPEC raises issues of debt sustainability, environmental impact and financial transparency. In particular, Ms. Zhou noted how economic growth in Pakistan has not yet proven to be an inclusive economic growth, hence the cross-regional distribution of wealth has to be taken into account when assessing CPEC’s impact. 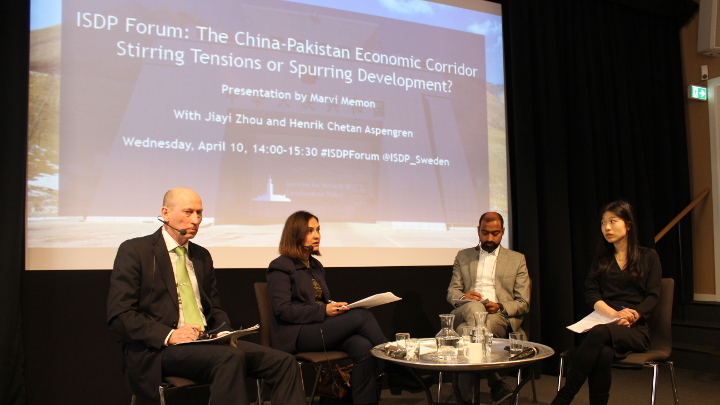 Moreover, Dr. Aspengren asked how CPEC can be described as a fair business model for Pakistan, since most of the companies involved are Chinese State-owned enterprises. On this point, Ms. Memon said that while it is true that Pakistan could negotiate for a bigger share, the long-lasting positive relation between Pakistan and China acts as a guarantor on preventing issues on this subject to arise. When asked about the future of bilateral relations and issues of debt-trap diplomacy which have been subject to discussion in other BRI projects, Ms. Memon was adamant that the bilateral relations between Pakistan and China would continue to be strong and mutually beneficial. Ms. Memon consistently reiterated her faith in the fact that the current purview of CPEC is already showing a genuine contribution in Pakistan´s economic development. The forum ended with a short Q&A session with the panelists, mostly focusing on the criticism that CPEC is facing from Western nations. ISDP would like to thank Ms. Marvi Memon, the panelists, and members of the audience for participating in the discussion. Watch the video from the forum here.